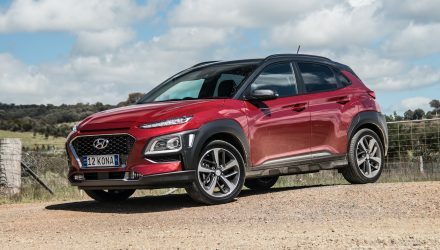 Hyundai has successfully exorcised the demons of its past and won the hearts and minds of middle Australia, so now it is turning its attention to creating genuinely cracking sports variants of the range. 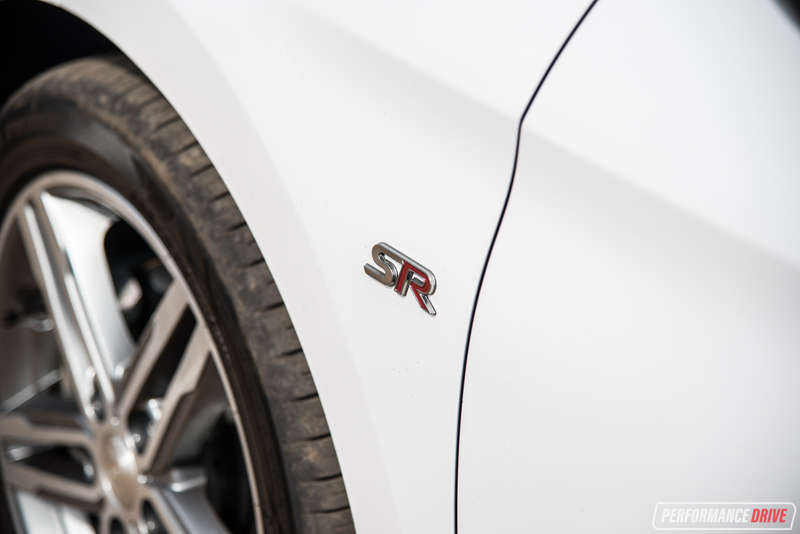 Its new N performance division aims to be competitive with the best from VW, Ford Performance, and GM’s OPC/VXR skunkworks. The company has even wheeled out a bonkers RN30 concept to show how serious it is. 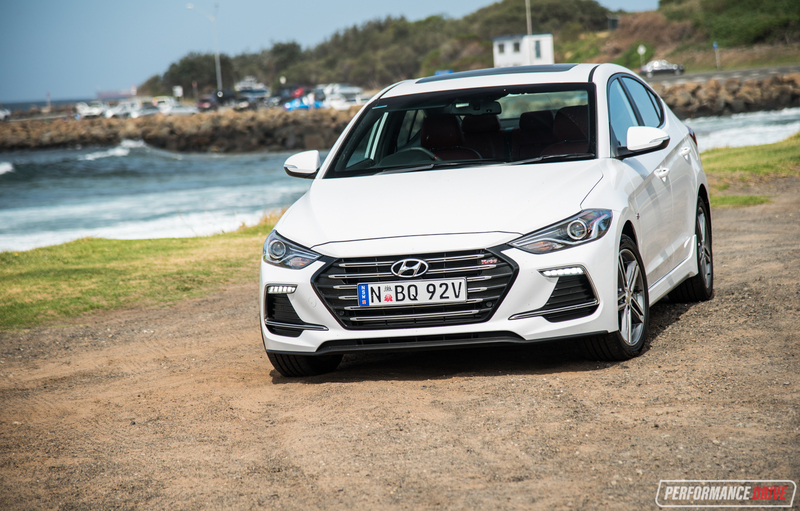 The first N-branded car will be shown next year, based on the new i30. 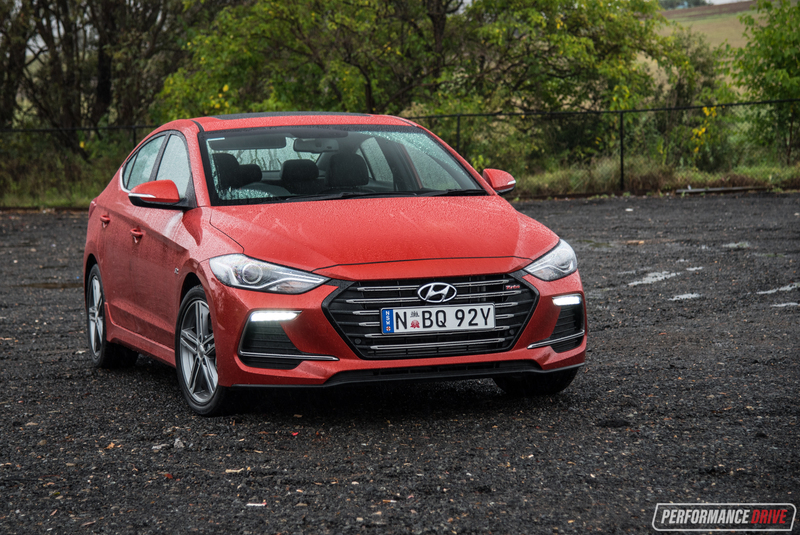 In the meantime we have the 2016 Elantra SR turbo here, which shares its platform with the upcoming i30 and drivetrain with the Veloster SR turbo. 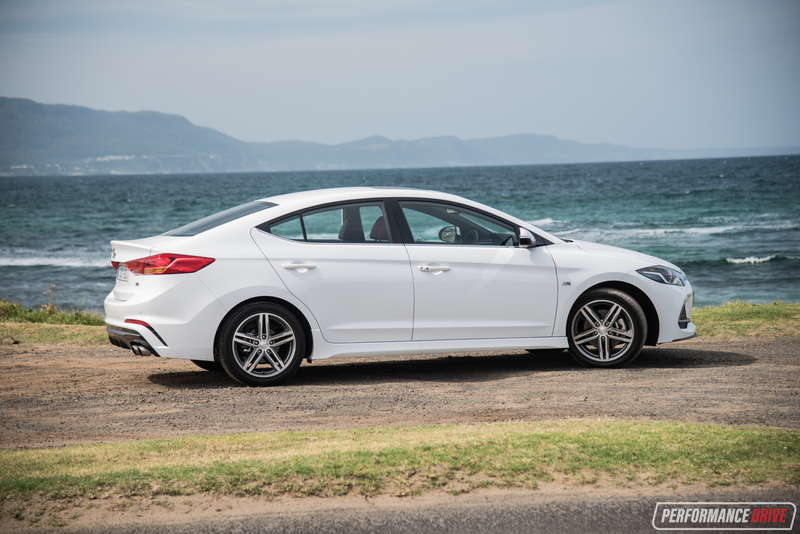 Its 150kW/265Nm 1.6 turbo engine is a neat performer in that car, and eclipses a lot of rivals for output when transplanted into the more staid Elantra body. 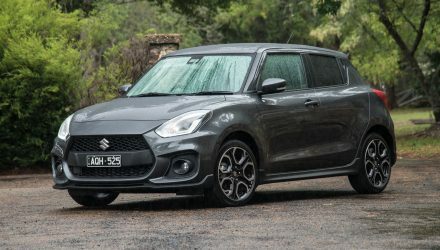 At $28,990 for the manual and $31,290 for auto (excluding on-roads), it is priced right in the guts of Focus Sport, Mazda3 SP25, Corolla and Holden Astra RS-V territory. 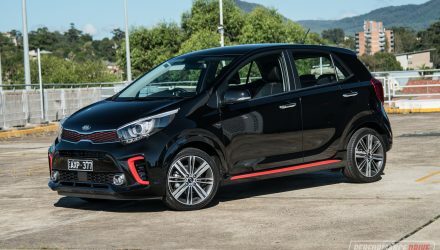 But it is a bit spicier than those cars, aiming perhaps to be in Golf GTI and Focus ST territory, but for nearly $10K less. 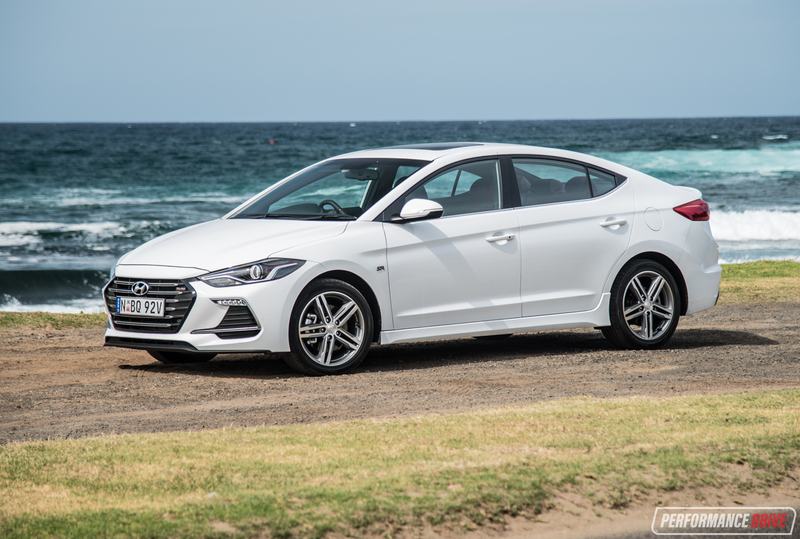 How this Elantra drives will give us a strong indication of what to expect from the forthcoming i30 N – which is routinely one of Australia’s best-selling cars. We’re sampling both the manual and dual-clutch automatic to see what’s what. 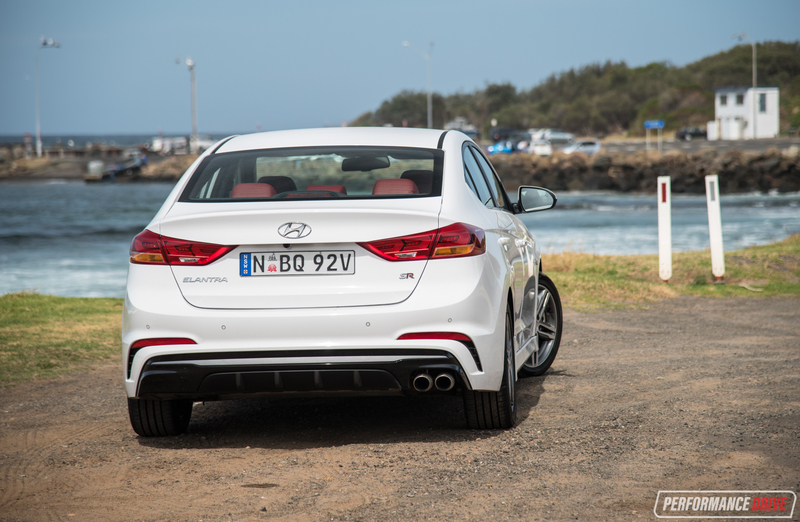 Hyundai’s small sedan measures 4570mm in length, 1800mm in width and 1440mm tall on a 2700mm wheelbase. To look at, the basic shape isn’t elegant, with large doors squeezed into a small silhouette with an awkwardly terminating tail-end. 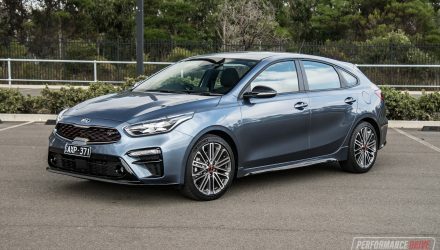 The details lift it up, such as the confident head and taillight LEDs, the sporty diffuser at the back, and the design of the 17-inch alloys. Our searing Phoenix orange auto test car stands out, too. 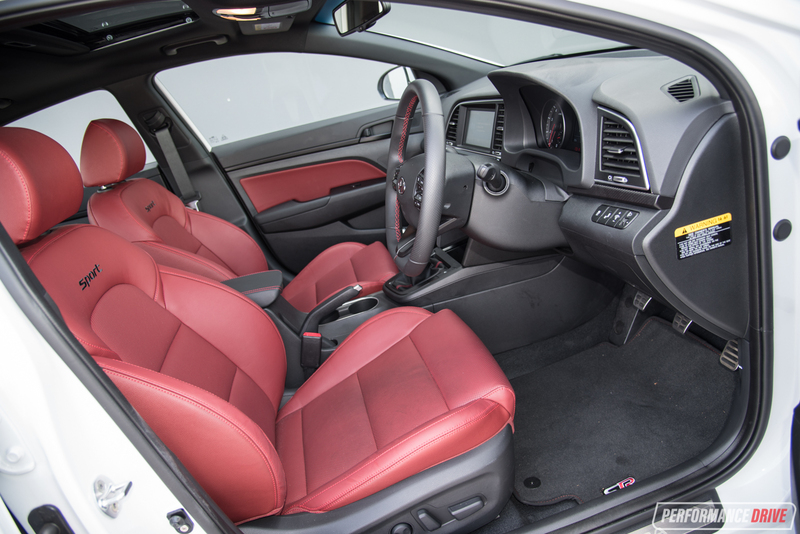 Room for passengers is quite generous with the electrically adjustable (for driver) leather sports seats proving comfort, high quality and well-bolstered support. Vents for rear passengers are a welcome addition, as is the scalloped centre console for middle passenger legroom. The interior is orthodox in its layout and functionality, with neat and logically placed buttons, easy to read, white-lit dials. 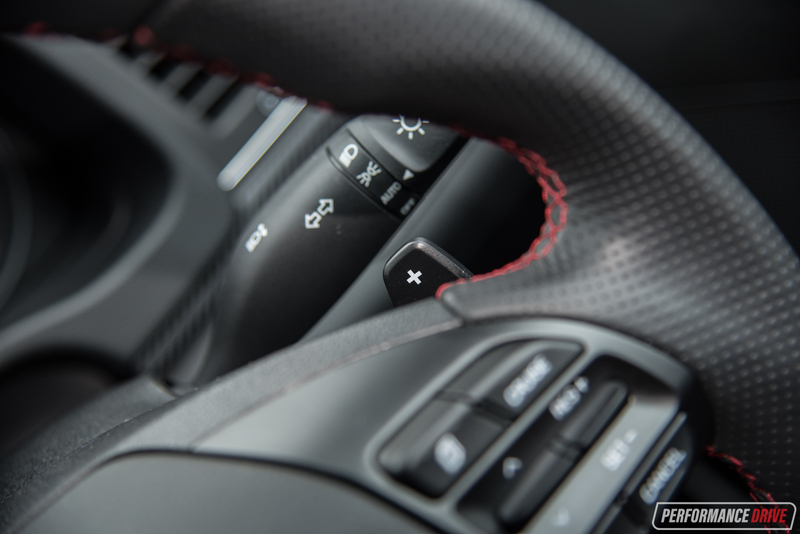 Materials are good all round, with soft-touch plastics almost everywhere, and a nice feel for the main controls. 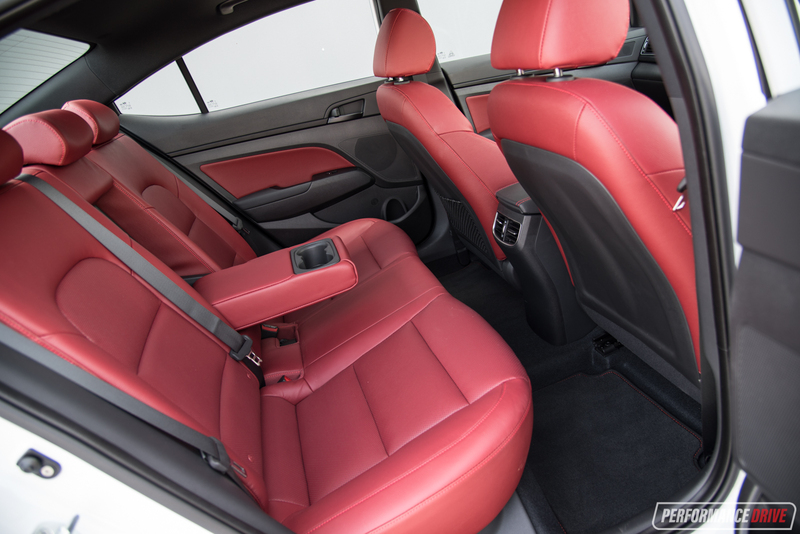 Our manual test car came with the sultry red leather option, which costs just $295. Likewise, the driving position is excellent, with a new flat-bottomed wheel not only eyebrow-raising to look at, but also to hold. The steering wheel boss is particularly shapely, resembling a supermodel’s derriere (apologies for the distraction). 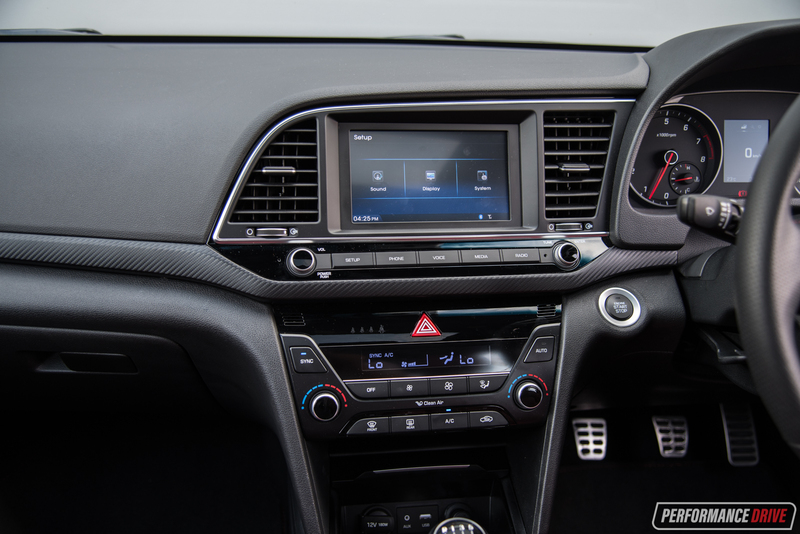 The infotainment touch-screen and audio are user-friendly with strong sound reproduction from the standard six-speaker stereo. Apple CarPlay and Android Auto work beautifully via the touch-screen. 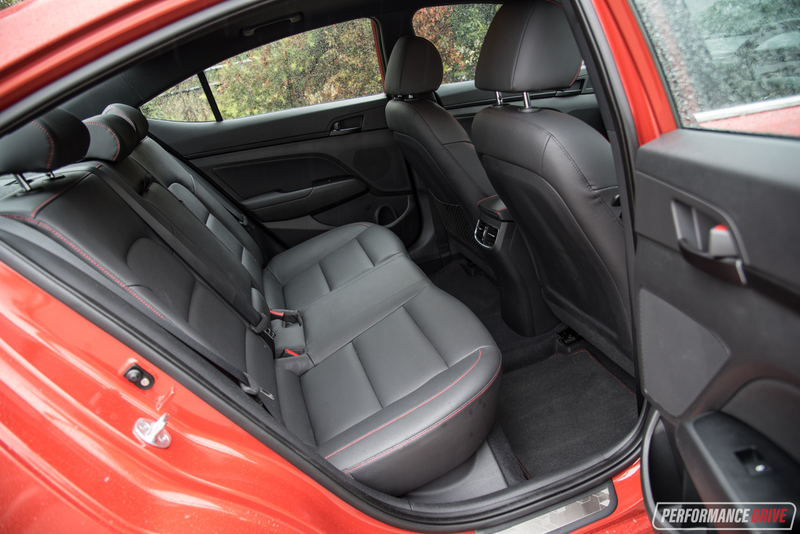 To sit inside, it might not be quite as upscale as a Golf and it’s not as hewn-in as a Mazda3 either, but it’s miles ahead of Ford’s fussy Focus. It’s a fine place to be, even if it lacks adventurous design flair (red stitching/accents notwithstanding). 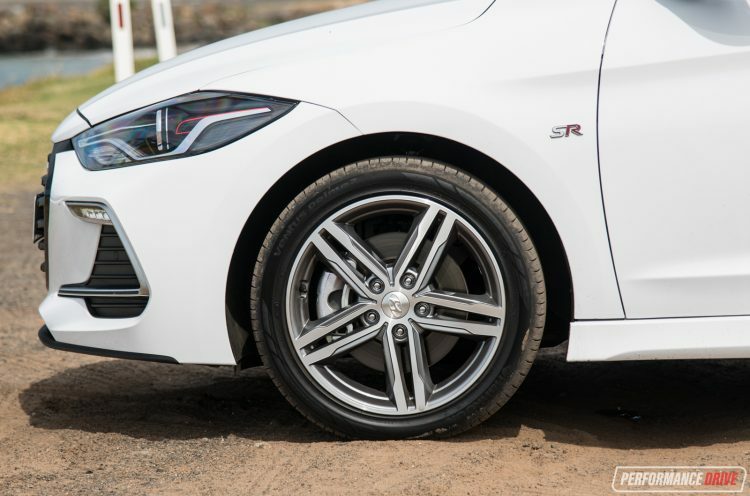 Surprisingly for a Hyundai, we found a space-saver spare tyre instead of the full-sizer which usually garners praise from us. 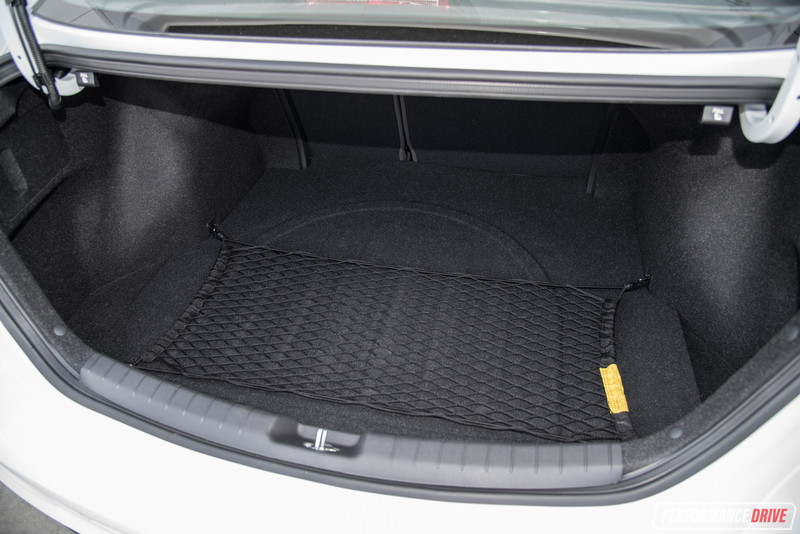 It sits within the 458-litre boot floor. 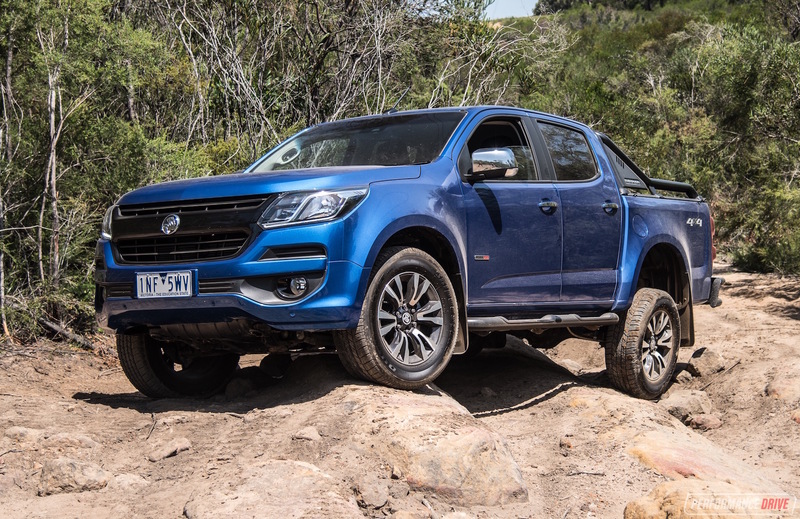 Redemption comes in the form of the five-year/unlimited kilometre warranty, a generous roadside assistance program and servicing capped between $259 and $299, across 10,000km intervals. A five-star ANCAP safety rating, as you would expect, is standard fare, as is a well-calibrated stability control system which was one area Hyundai’s Australian engineers meticulously calibrated on our roads. This is on top of initial development at the Nurburgring and Namyang, South Korea. Other aspects include steering and suspension tuning. Read on to find out if the fruits of their efforts have paid off. 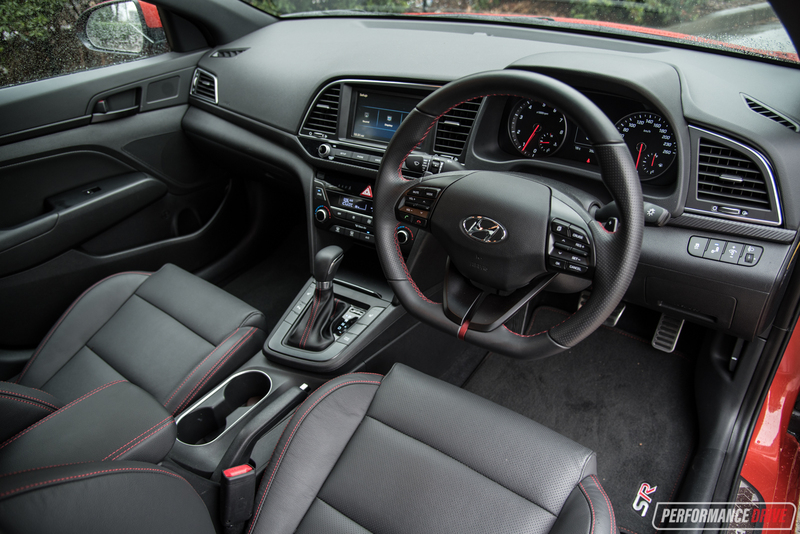 The comfortable, supportive seats and simple, neat and ergonomic interior are all items which make the Elantra SR a pleasant place to sit. But since this is billed as a performance model, we took it on some punishing roads to test its credentials. 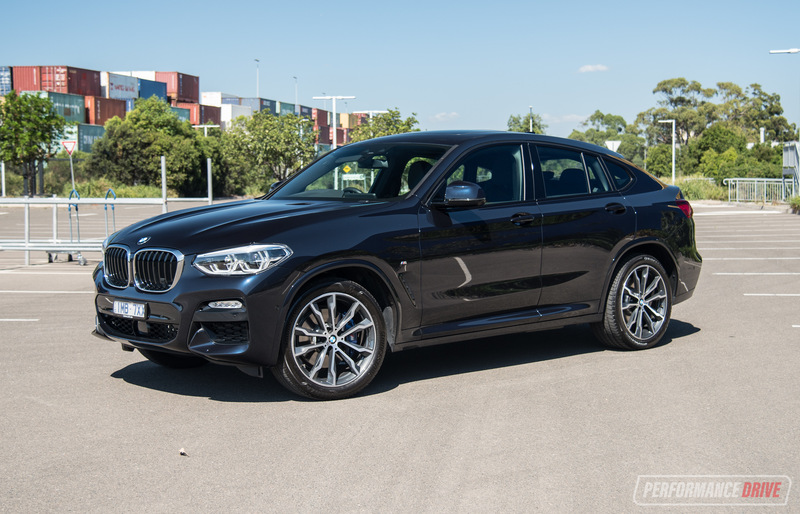 Being an all-new platform, the body is very rigid, as it has to be to compete with Europe’s best. 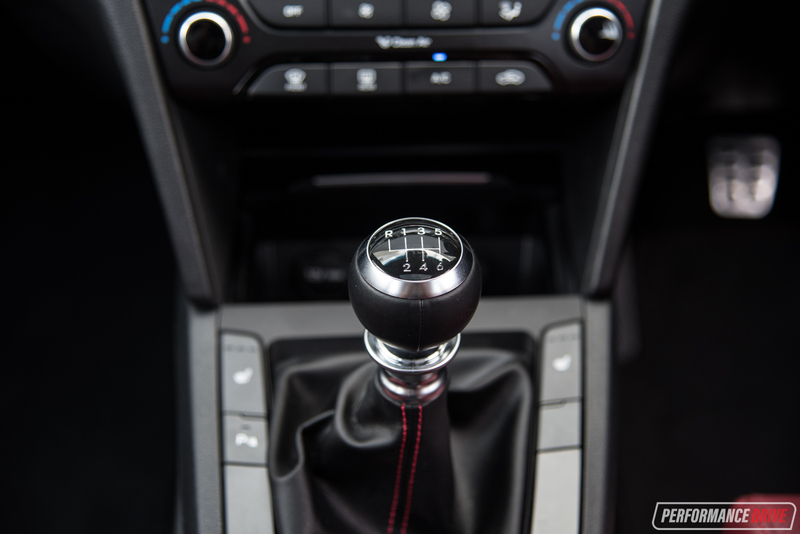 This has allowed a firm damping rate without the trade-off of a harsh ride. 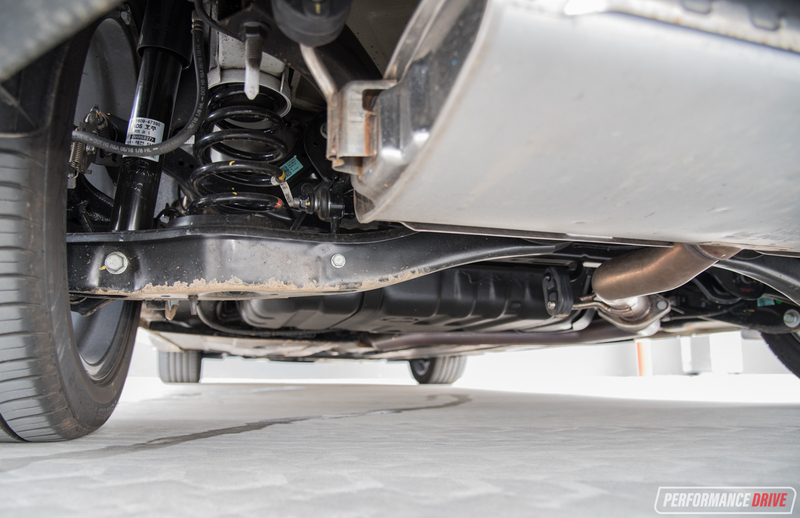 Underneath, the SR uses a bespoke suspension setup with multi-link independent at the rear with the usual MacPherson struts at the front, as opposed to torsion beam as featured on the regular Elantras. 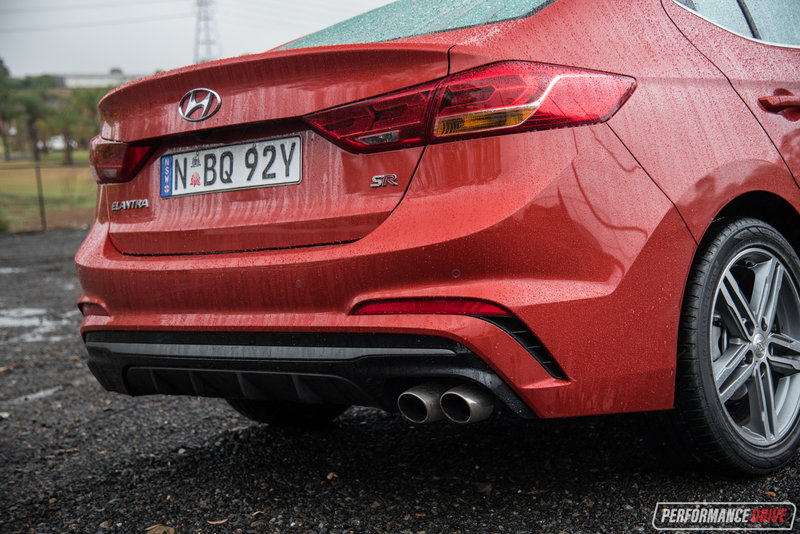 With this, the rear end feels noticeably more planted and secure, especially trailling around long bumpy bends. The steering is direct, weighing up progressively as you move further off centre and as centrifugal force increases. 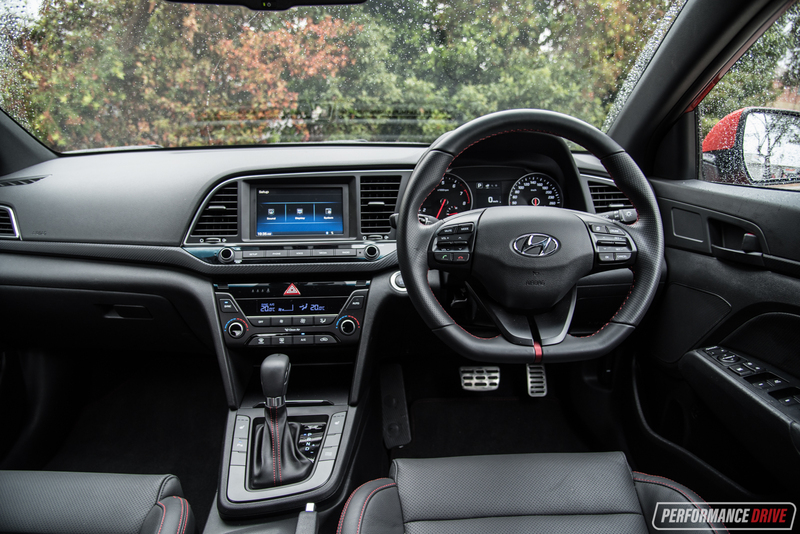 Unlike the outgoing i30, with its switchable steering modes, this single calibration is just right and we hope it is kept for the third-gen i30. Hyundai Australia helped tune the steering for the SR, which requires just 2.57 turns lock-to-lock. With both the suspension and steering working in unison, the Elantra SR is a genuinely fun car to drive down your favourite road. It hangs on further than you expect, stays flat and roll-free, and feedback and driver engagement is surprisingly high. 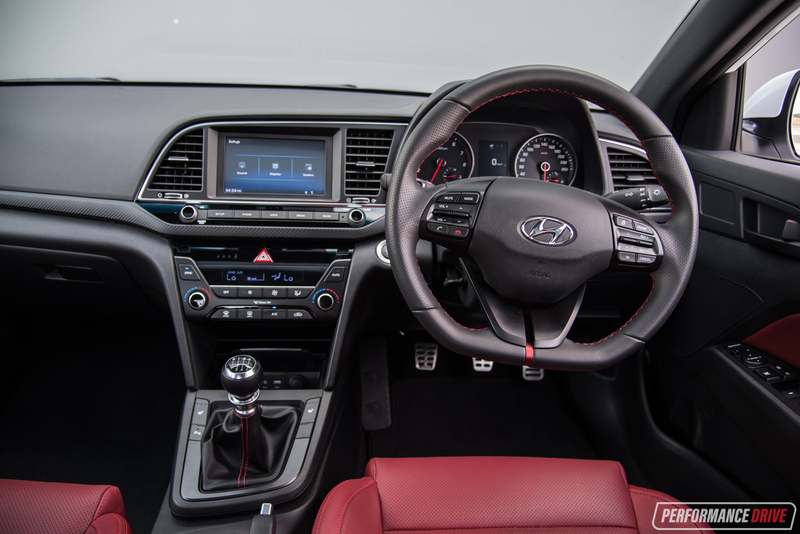 We’d even go as far as saying it is quite a lot more enjoyable to drive than the Veloster SR.
As mentioned, the engine is a 1.6-litre turbo. 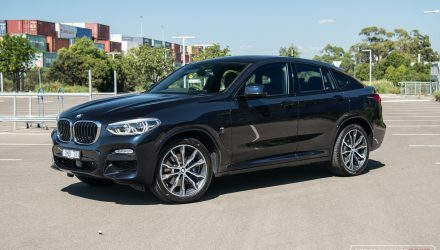 It presents peak torque from 1500rpm all the way to 4500rpm, so it can be placid and effortless around town and on the freeway, or rapid and responsive when you ring its neck. It even sounds nice when you kiss the 6000rpm redline between gearchanges. 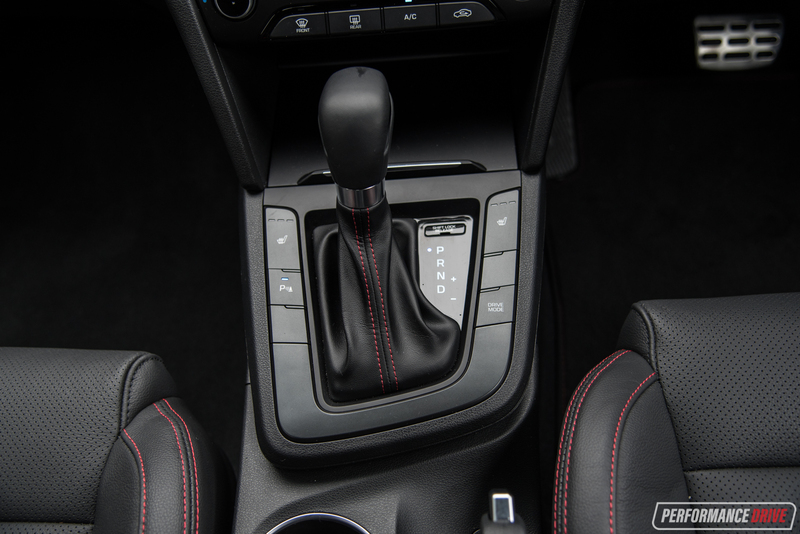 Speaking of those, the manual feels decent enough, albeit with a doughy clutch that delays snappy gearchanges and can be a bit tricky getting off the line. 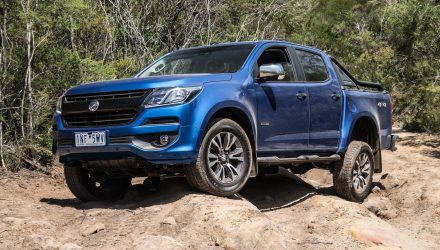 The best bet is the DCT auto, with its lightning-fast changes – up and down – that keep the engine on the boil and still give the driver a sense of control from the shift paddles. The extra ratio also helps endow the auto with superior performance. We timed a best 0-100km/h sprint in 6.87 in the auto and 7.29 in the manual. 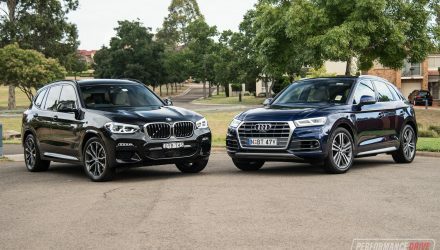 Both cars crossed the quarter mile point at exactly the same time, after 15.23 seconds, with the DCT pacing through just 0.1km/h faster. 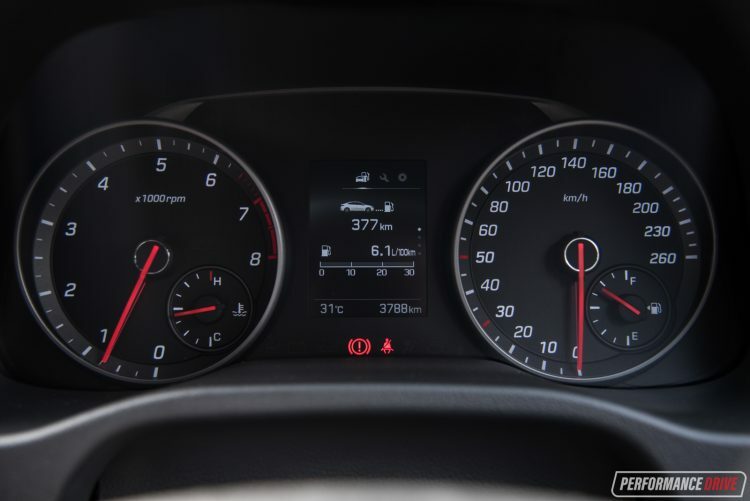 Economy on test was averaged at 7.9L/100km in the auto, which is only 0.7L/100km out from the factory claim (7.2). In the manual we actually achieved lower that this, at around 6.8L/100km, however, the official average is 7.7L/100km. Like any car, it simply depends on how you drive. 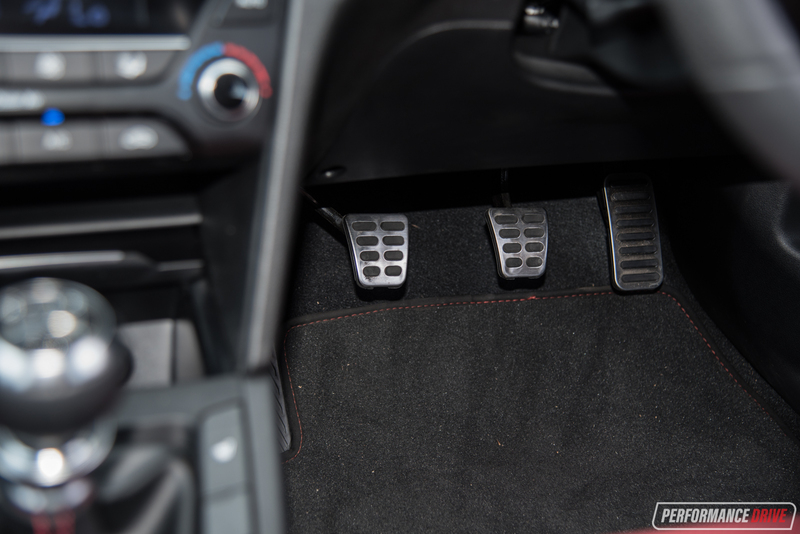 The manual gear throw is smooth and it slots into gears with reasonable precision. It no doubt helps to make the drive more interactive and even causes you to reminisce over the ‘good-old days’. But as much as we hate to say it, the manual is soundly beaten here, despite its $2300 cheaper price. 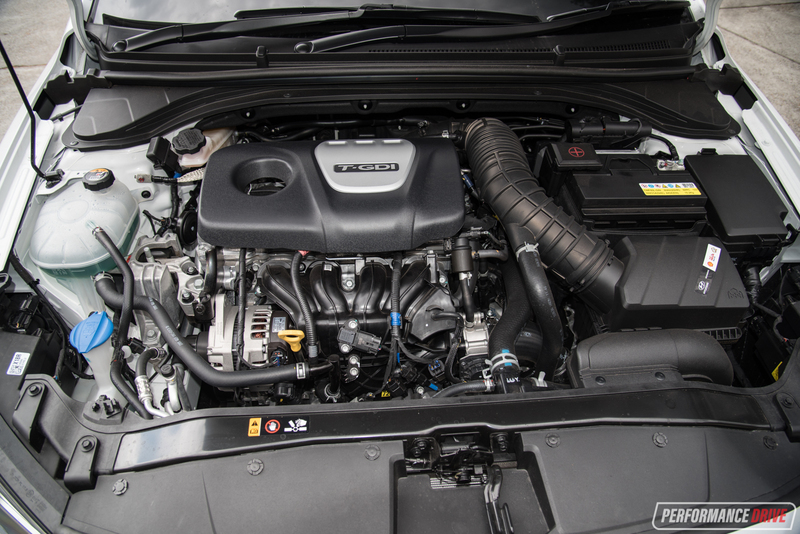 Both fuel economy and performance are superior in the auto. The zingy engine, perfectly-judged and reactive DCT gearbox (or fun manual), and excellent steering combine to give you a confidence-inspiring corner-carver that gives you a bigger grin than you could hope to get from this segment. 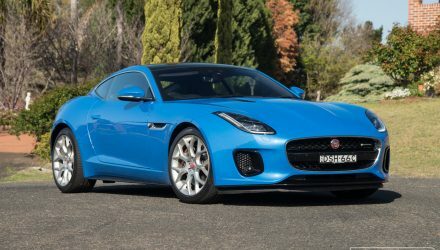 There also seems to be a certain unassuming subtly that makes it more alluring – you simply don’t expect it to be this nice to drive. 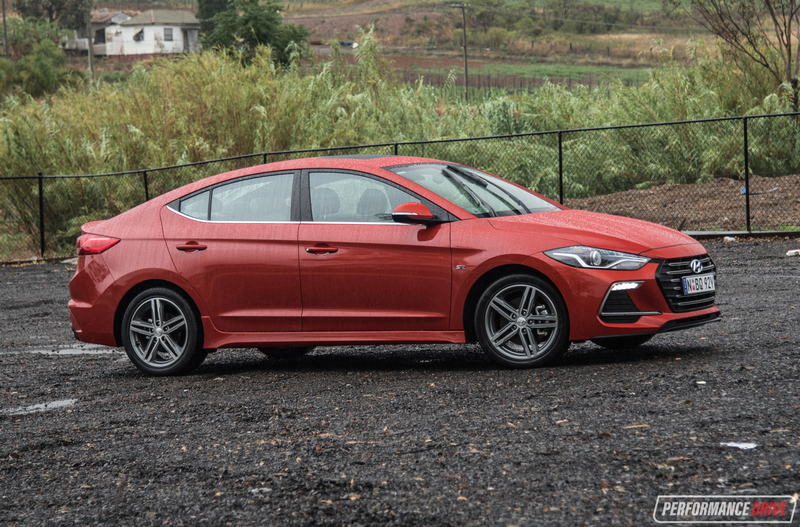 The Elantra SR’s power and competent chassis make it more satisfying around a twisty road than some of its feebler rivals. 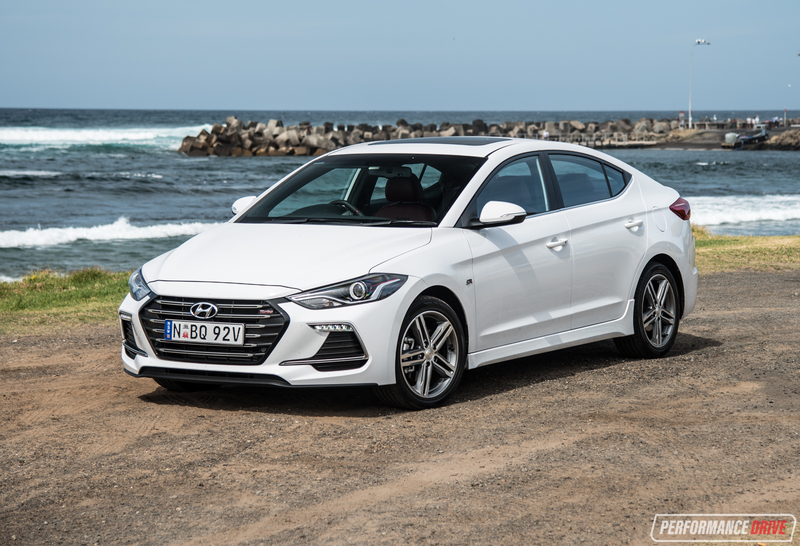 Hyundai has delivered a chassis that is engaging enough to compete with the best in class. 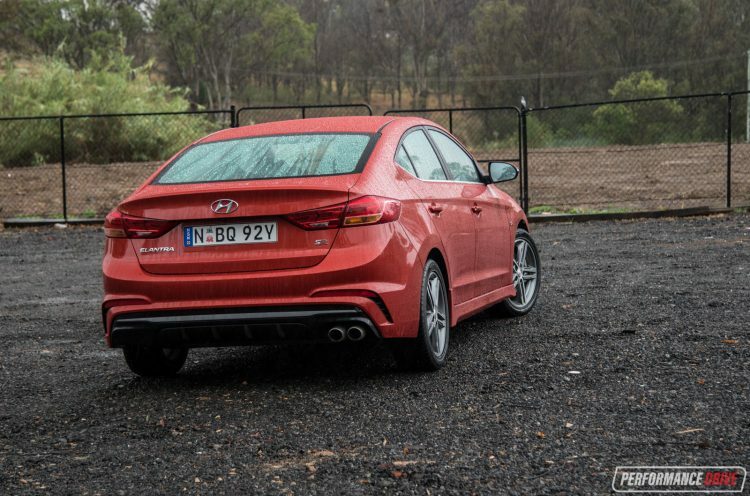 It might not reach Focus ST and Golf GTI for sheer performance, but it is closer in terms of fun to those cars than the warm hatches it is priced against. 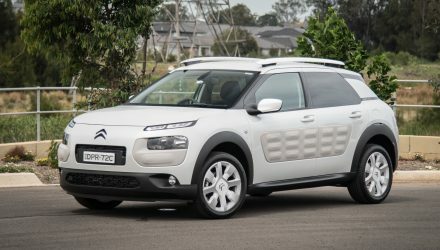 As a bonus, it is spacious, affordable and affordable to run, looks decent and comes with an excellent warranty. 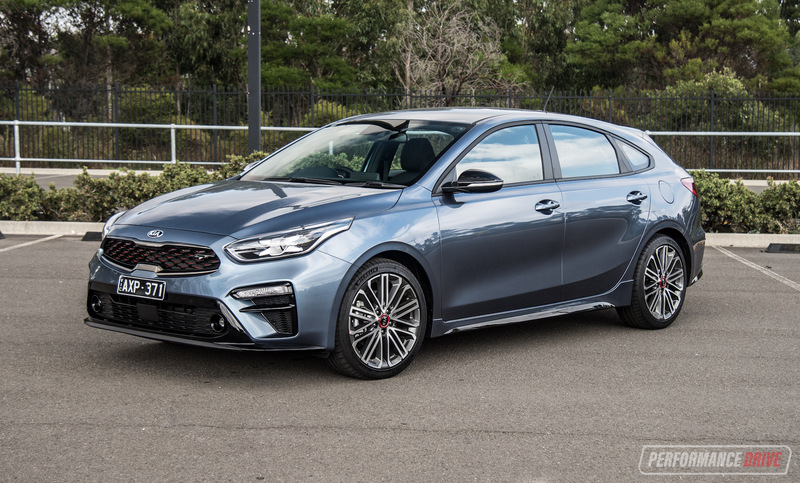 This is a major coup for the brand and a good sign of things to come for both the new i30 due in a few months and the N performance models that will follow it. 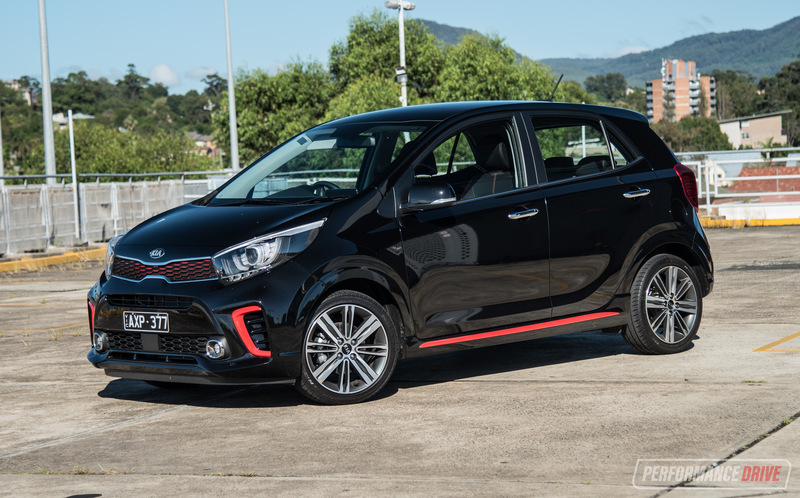 If you have around $30,000 to spend on a small car and genuinely enjoy driving, we think you’d be foolish to not at least take this one for a test drive.